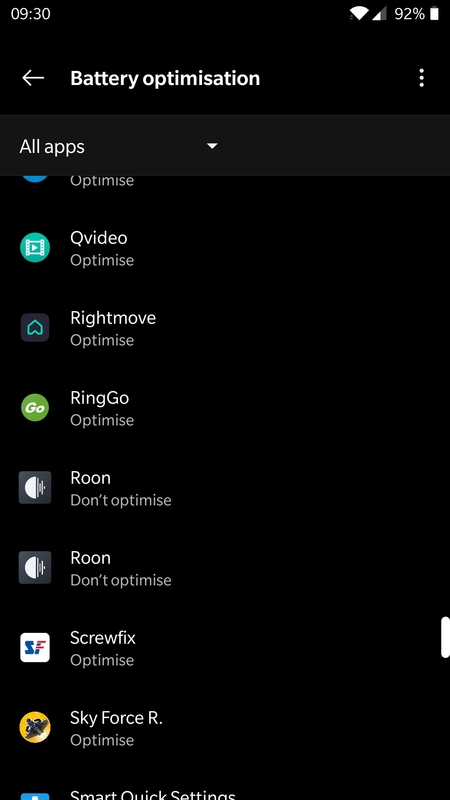 Hi I just noticed that looking in battery optimization on my phone, Roon has two entries, don’t remember seeing this before. @support is this normal behaviour? Thanks for reaching out! I’m going to check with the technical team on this, I’ll let you know when I receive their feedback. Just to verify when you look through your apps you don’t see Roon listed twice, correct? I spoke with the team about this, and this isn’t behavior that they’ve seen previously on Android and have not been able to reproduce. 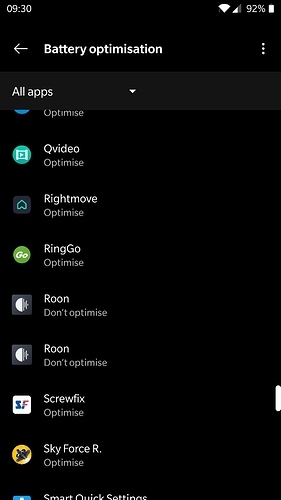 If you uninstall the app temporarily do you still see one of these Roon icons showing in Battery Optimization? Upon reinstall does the same behavior occur? Thanks for confirming that, @CrystalGipsy! I’ve passed along this update to the team, I’ll be sure to let you know when I receive their feedback for next steps here. Can you confirm what type of Android device this is? OnePlus 5 running the latest version of OxygenOS which is based on Android 9. I met with the team today about this. A member of the team has the same device that you have and is unable to reproduce this behavior, and it’s not something we’ve seen before. Based on what we’ve seen, this doesn’t appear to be something that is specific to the Roon app — It seems as though this is something that occurred on the OS, but our team isn’t sure what could cause that type of behavior on Android. We will let you know if we find anything else about this. We appreciate the report!